30, 60, and 90 drawer cabinet systems. 3-1/2" high extra large capacity drawers. Prime cold rolled steel construction. It's easy to store large quantities of small parts in the high density drawers. Drawers have interlocking design for superior strength and have full width handles and easy glide runners. Each drawer includes 2 dividers that are movable on 1" centers and easy to label. Vertical supports inside the cabinet provide added strength. Fully welded base is included and raises unit to 5-3/4" above the floor. Durable gray powder coat finish. Ships fully assembled. FOB Shipping Point. 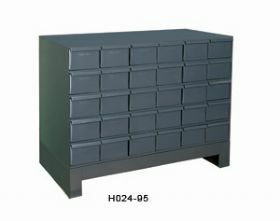 Models H024-95, H025-95, and H026-95drawer size is 5-3/8 x 11-1/4 x 3-1/2". Models H027-95, H028-95, and H029-95drawer size is 5-3/8 x 17 x 3-1/2".